The spirit of travel has become an illusory concept. Anyone who’s had to endure, amongst many things – the humiliation of the pat-down at flight security checks; the unending removal of boots, coats and belts on to filthy plastic trays; the sad lounges with its disenchanted staff; being hauled into a wait room because you fit a certain stereotype – would balk at the very idea. L’esprit de voyage? That was unceremoniously stamped out with the advent of Economy Class (the connotation more than the stratum lest you think me a snob) and terrorism threats – both seemingly perfect excuses for the worst time you could possibly have on a voluntary basis. Like me, you may have already witnessed a full range of horrors – and that’s just on Business Class. Beyond less than desirable flying conditions, overcrowding has had tourists gain the ire of locals in Barcelona, Santorini, Venice and other destinations now deemed places to visit before one’s demise (“What? Not visited Dubrovnik? Then you cannot die!”) Tour groups swarm into towns. It is an invasion of loud active wear, even louder sandals, screaming children, even the playing of Despacito on tinny phone speakers for all and unwitting sundry to hear. You get the idea. I’m inclined to agree with Theroux but, to be sure, the Belmond Royal Scotsman is no ordinary cross-country sleeper. 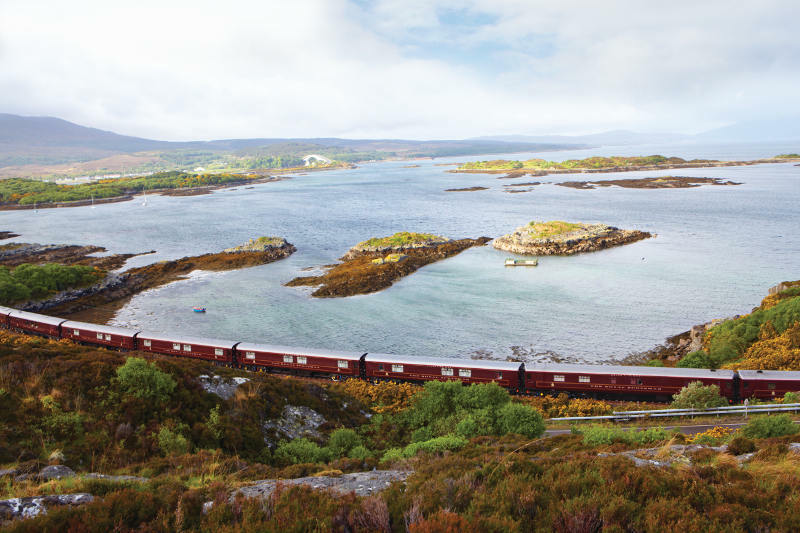 It is one of the world’s most luxurious trains, winding through some of Scotland’s most breathtaking sights. 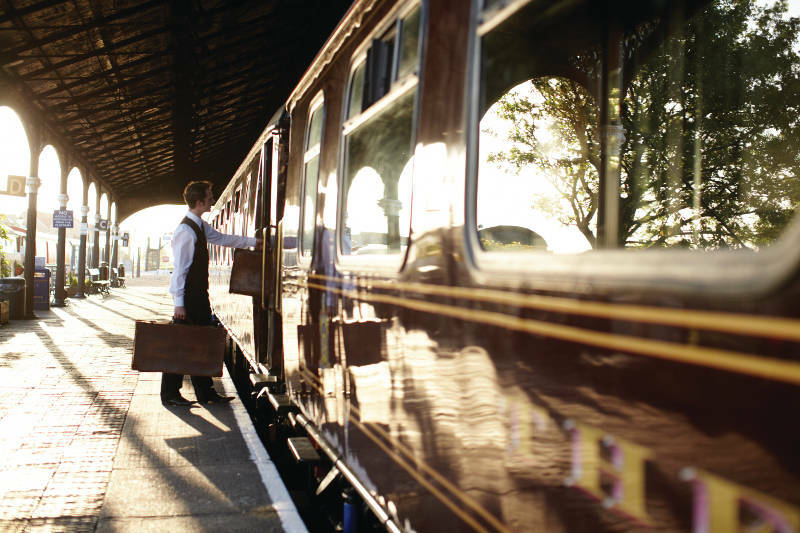 It presents, from the minute you are on the platform to the time you’re on board, a relaxed, elegant way to tour – a step back into the golden age of travel. Call it the epic journey. The sort Maugham and colonial co romanticised, that Lean and Visconti lovingly recreated on film. It is the type of travel long since forgotten and thought extinct. Here, the journey is as important as the destination. Nothing more is required of you than to sit back and enjoy the sweeping vistas passing before you, enjoy the luxury of reading a book, partake in a glass of sherry for cocktails, be served at the table by a coterie of wait staff and dress in sheer finery for dinner. The exclusivity is unparalleled. Up to only 36 guests are invited onboard every journey with at least 12 staff attending to our every need. There is the promise of a ‘grand highland fling’, beginning from the point a red carpet is literally rolled out in your honour at Edinburgh’s Waverley Station platform while a bagpiper in full Highland regalia sends you off on your journey. It makes for a fantastic first impression. 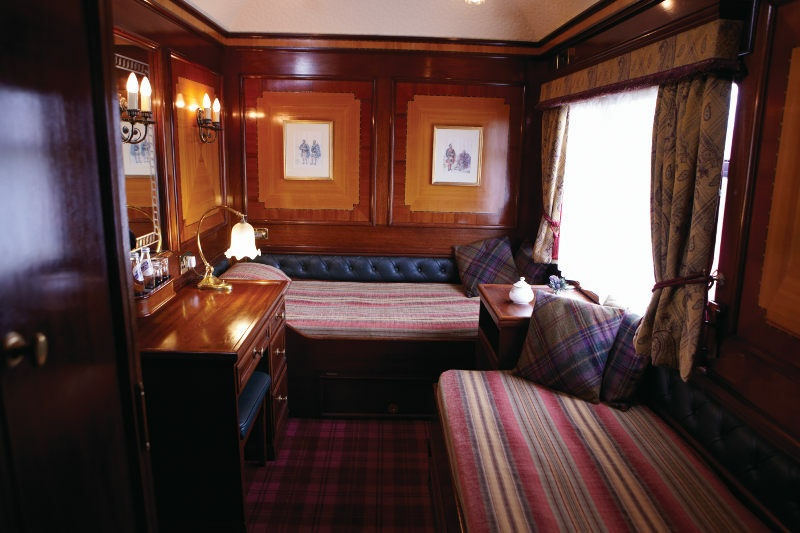 Well-appointed carriages, decked in fine mahogany marquetry, gleamed and shone inside. 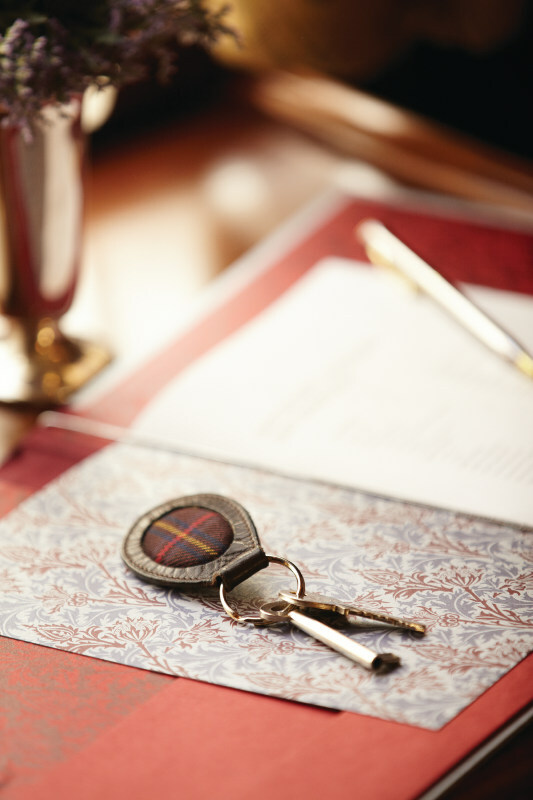 The train’s interiors bore the hallmarks of an Edwardian era with wool tartan cushions and tweed furnishings adding to the surroundings, all tastefully selected without teetering on twee. In the observation car, waiters stood at the ready with flutes of champagne while guests lounged and made introductions. As the train pulled away from the station, there was a palpable thrill of excitement from all on board. The sudden, inexplicable need to wave at total strangers at the platform and a hearty toast from Michael Andrews, the General Manager, set us off on the proverbial (and literal) right track. To say there’s nothing to do on a train shows a lack of imagination on the part of the person saying it – and is really missing the point of the entire journey. 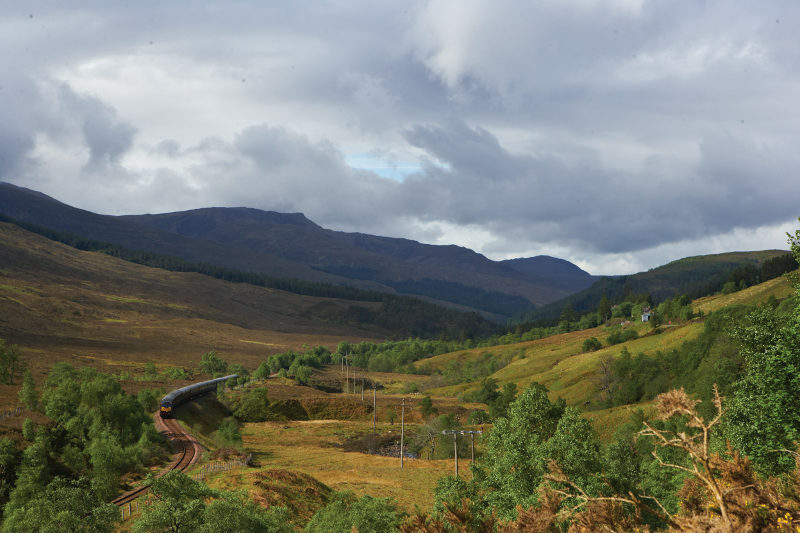 If you were not already bowled over by the commanding presence of mountains and lochs, dales and vales, then there is the very experience on staying on the train itself to be relished. The cabins – intimate in size and, yes, small but cosy – were no doubt decked out in understated luxury, with comfort of paramount importance. I imagined what it would be like for lovers in my L-shaped arrangement. Would they wave at each other from the twin beds from opposite ends of the L, or snuggle into a soft human spoon, sharing one small bed? In my cabin, the rollicking rhythm of the train on the tracks lent an almost hypnotic, calming effect. I considered a massage – there were two spa rooms offering Bamford Spa therapies – but was, instead, cajoled into a drink with the professor. We stood on the small outdoor deck contemplating the universe while he had a cigarette and I, a dram of exquisite single malt. Perhaps it was the train and its confines that inadvertently heightened the senses. What other reason could there be to be drawn to someone who would think nothing of spewing platitudes about vampire squid and Gerald Durrell, while dressed in a linen safari suit not seen since Roger Moore’s Bond in Live and Let Die, replete with old-fashioned leather suspenders? Afternoon tea was served on our first day – just-baked scones and sandwiches, dollops of preserves, biscuits, honey, tea, freshly brewed coffee – while we travelled along the edge of Gare Loch where in the distance, Ben Arthur or The Cobbler, so called for its distinct outline, loomed. 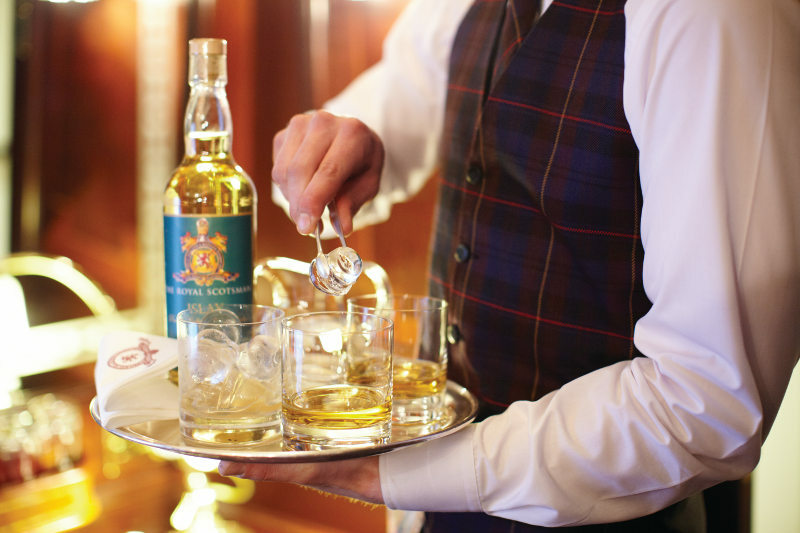 Indeed, dining onboard The Royal Scotsman is a gourmand’s delight. We were never without silver trays laden with summer fruit – apricots, cherries, nectarines, or chocolate or pistachios and almonds – there to entice us throughout the day. 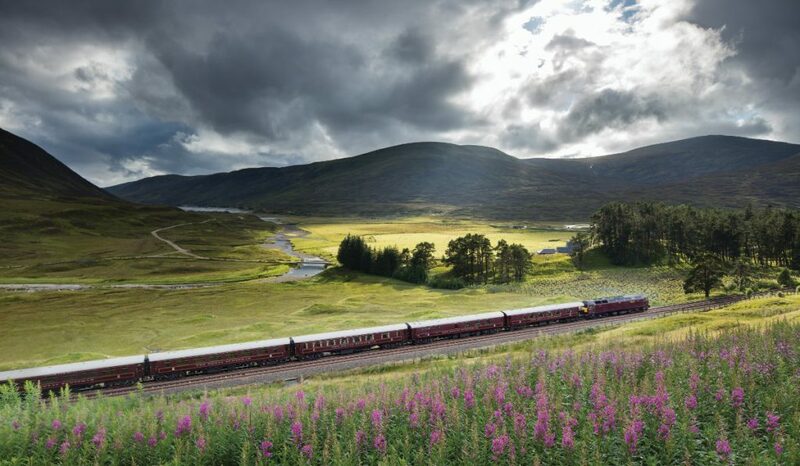 During the course of the journey, we savoured traditional Scottish fare and fresh local produce, like the roast venison that drew praise from those at the table, and just-caught salmon as pink in the flesh as can be. All this was no less due to the attention to detail and culinary masterstrokes of Chef Mark Tamburrini, onboard with only one kitchen staff to tend to all 36 of us. Loch Lomond, Britain’s largest lake, soon came into sight before the train descended almost to the water’s edge at Ardlui. The train’s climb up Glen Falloch a while later gave us a glimpse of waterfalls in the distance. 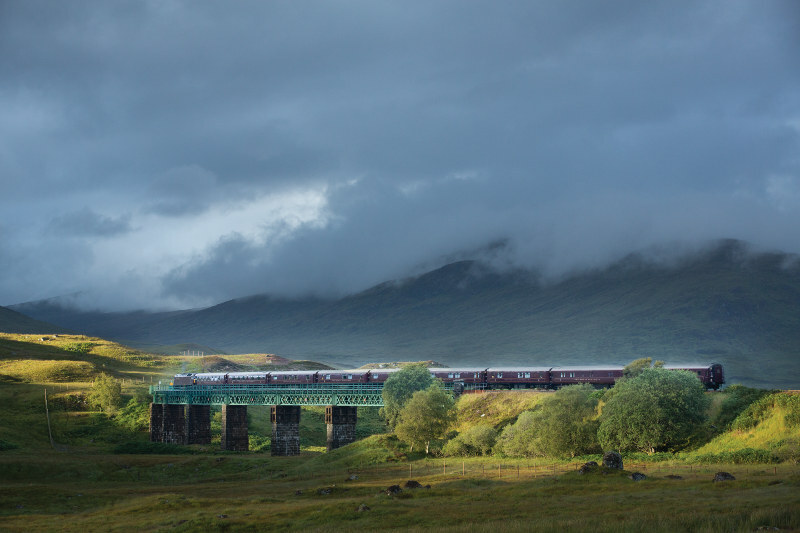 Soon, we passed Crianlarich and the Bridge of Orchy, then on to one of Scotland’s last great wildernesses, the Rannoch Moor before stopping by Spean Bridge Village. It’s hard to refrain from the myriad adjectives each scenic sight brings – magnificent, magisterial and just plain gob-smacking. Recently named the most beautiful country in the world by a Rough Guides readers’ poll, Scotland’s scenery is varied and picturesque, changing dramatically from mile to mile and providing view after amazing view, even as the train charged by the scenic side of Loch Eil the next day, past Lochailort hamlet before heading north towards Arisaig. She was right. 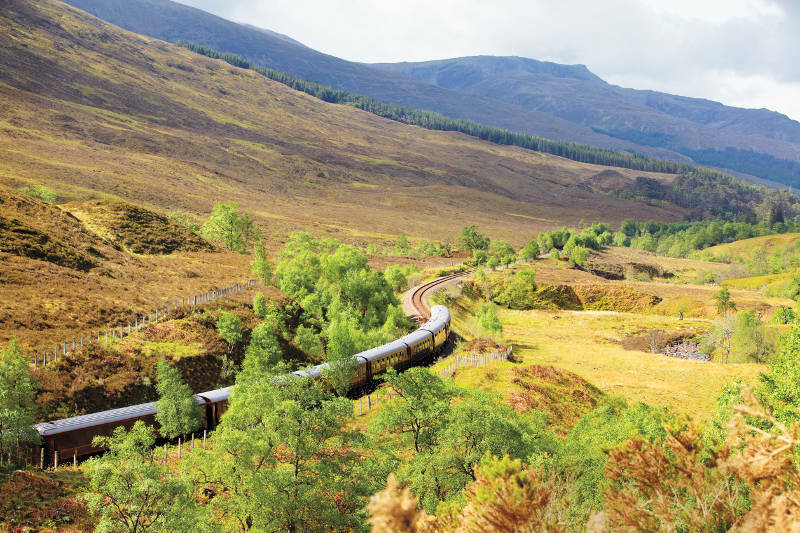 Nothing could quite prepare us for the ride past Glenfinnan with its cinematic curved viaduct, the longest concrete railway bridge in Scotland. Built in 1898 and spanning 15m, riding the viaduct over the River Finnan was really the climax of this journey. Small wonder then that it has made star turns in various movies, most notably in at least four Harry Potter films. That’s not to say that the entire trip was limited to the indulgent confines of the train itself. Those who woke up early that morning to join Michael on a scenic walk were rewarded with a surprise stop nearly a mile away from the Spean Bridge station, the Commando Memorial, a cast bronze statue of three commandoes erected as tribute to the men in the original Commando British Forces who fought in World War II. We were also easily smitten by the experience of a languid stroll along the Morar Sands upon reaching Arisaig. The Sound of Sleat, the Isle of Skye and the Cuilin Mountains provided a romantic backdrop even as we came back to smiling Royal Belmond staff standing by the shore waiting with glasses of champagne and canapés. Our last stop for the evening was at the tiny Argyll village of Bridge of Orchy. There were hearty discussions as we convened for dinner. This went from pop culture to evolution, nature conservation to how we thought the day went. Curiously, everyone avoided politics, perhaps conscious of differences in opinion. The unspoken rule was to make the train ride as uncomplicated and as much of an escape from the frenetic pace of urbanity – and its stressful consequences – as possible. Instead, this was a real chance to savour a different world and enjoy each other’s company despite our differences. As with the night before, the evening ended with a nightcap – a dram of Laphroaig 12 for me, for others, glasses of port and cognac – as we enjoyed the nightly evening entertainment. While the previous night had two gentlemen presenting a lively musical Scottish journey filled with Robert Burns songs and even a Proclaimers tune, tonight was mellow with a beautiful violinist and her guitarist fiancé singing tales of love, lost and gained. Sunday saw us enroute to the Isle of Bute, a quaint island seemingly stuck in a Victorian time warp. There, a leisurely day was spent exploring Mount Stuart, a Victorian Gothic manor owned by the illustrious Bute family that included the first Stuart King and UK’s first Scottish Prime Minister. The manor was a technological marvel for its time but more impressive was the family’s collection of curiosities including Shakespeare’s First Folio, the copy of the first edition of Shakespeare’s plays that were found within the premises, and the dueling pistols of Bonnie Prince Charlie. We dined in formal dress on our final evening. Men who could claim Scots ancestry opted for kilts; those who could not, black tie. All were outshone by the admiral who entered the dining car in naval dinner dress whites, his wife, Linda, proud at his side. They had met as teenagers at the local swimming pool – he was, of course, the lifeguard. “I knew, from the minute I saw her in that white bathing suit, that she was the one.” “You were the instigator,” she said. “I still am.” She blushed.